The National Service Flag in the Competence of the Foreign Office (Reichsdienstflagge im Bereiche des Auswärtigen Amtes) is the black-white-red flag with a white [disc producing a] circular cut-out in the black and red stripe. In the white central disk an Imperial Eagle with the Imperial Crown. Adopted 8 November 1892 and 20 January 1893. Functions like the civil ensign in German protected areas. (Illustrated in Crampton 1990 p. 42 (which is a copy of Meyers Konversationslexikon 1912, vol. 4, facing p. 799), National Geographic 1917 p. 367, no. 1009). This was the flag of the authorities of the Reich (in the colonies which did not have their own flag) (with the exception of Kiaochao): black over white over red with the great Reich Eagle with crown on a white disc. The flag was known as: Reichsdienstflagge im Bereiche des Auswärtigen Amtes, einschl. der Kaiserl. Behörden und Fahrzeuge in den deutschen Schutzgebieten. As near as I can make out, the Prussian eagles have gold beaks and talons even when they are part of the Imperial arms, while the Imperial eagles have red beaks and talons [see for instance the emperor's standard]. The Foreign Office State Flag was black-white-red with a white disk surmounted by the complete eagle of the Imperial Arms of 1888, a black eagle surmounted by the imperial crown with a red beak and talons and the chain of the Prussian Order of the Black Eagle. Further in the escutcheon the Prussian eagle of 1888: a black eagle crowned with a royal crown and with gold beak and talons and holding a sceptre and orb, with an inescutcheon with the family arms of Hohenzollern [quarterly Argent/white and Sable/black]. I used an image of the lesser arms of the German Empire in Adam Kromer's Polish Heraldry website to make an image of the Foreign Office flag. According to Martin and Dreyhaupt 1999, the white disc has a diameter of 5/9 of the flag's height, and the flag's proportions are 2:3. This image could be used as a basis for the Foreign Office pilot and customs flags, by adding a yellow fouled anchor with the red letters 'L' and 'V' (Lotsenverwaltung) for the pilot flag and 'Z' and 'V' (Zollverwaltung) for the customs flag. I have re-drawn the Imperial German Eagle from scratch (that is, the version with Prussian Eagle in escutcheon). It has been pointed out that the incorrect style of central device has been used and so 3 re-gifs from me plus an enlarged detail of the correct version. The Pilot Flag in the Competence of the Foreign Office (Lotsenflagge im Bereiche des Auswärtigen Amtes) is like the Foreign Office state flag but with a yellow vertical anchor between red letters 'L' and 'V' in the upper hoist. Functions like the pilot flag in German protected areas. Like the Foreign Office state flag but with a yellow vertical anchor between red letters 'Z' and 'V' in the upper hoist. Functions as the flag of the customs service in German protected areas. Željko Heimer asked about the typeface of the letters used. Script was generally not defined, but there were official illustrations - some lying in the archives, some are known to several vexillologists. Some of them recorded and drew quite correct illustrations, others did not. Hugo Gerard Ströhl was one of the most important heraldists ever, who advised many governments. He wrote the Deutsche Wappenrolle (Ströhl 1897) where he shows the letters as a sans serif bold. Although he is only a secondary source, we can take him as correct. The original book showed flags 27 x 45 mm, large enough. Flaggenbuch 1905 only shows the pennant of Fischerei-Aufsicht, also with red sans serif bold letters. But I do not mind showing a serif bold, as it comes closer to what was in use on flags at that time (Mecklenburg and others used serif bold on earlier flags). 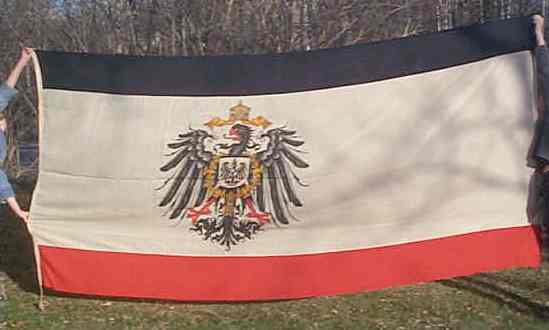 This flag appeared offered in eBay: "This flag is in virtually new condition, but is not a reproduction! It came from the German Embassy in Ottawa, Canada. This flag, with the Imperial German Eagle, apparently was never flown outdoors, and was probably hung up indoors, inside the Embassy. Apparently, it had to be taken down in 1914, once war was declared between Great Britain and Germany. This flag measures 13' in length and 6' 3" in width."